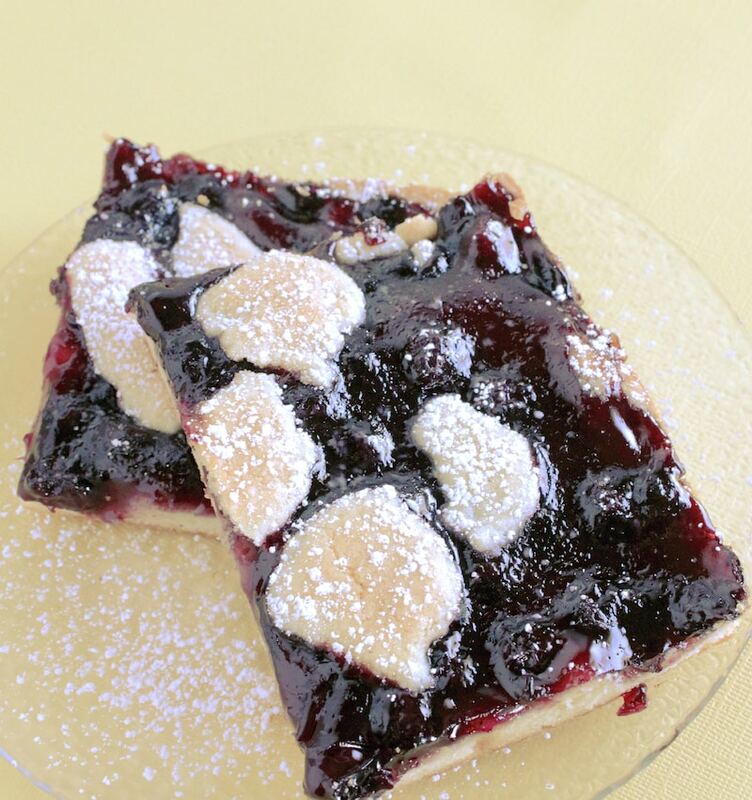 This Blueberry Pie Bar recipe should definitely get added to my 50 Things To Eat This Summer: Bucket List, right? I mean, doesn’t it just SCREAM BBQ or PICNIC? I think so! I love a good fruit recipe. A summer dessert is right up my alley and this treat is a sweet as can be. For this dish, we actually use pie filling so you won’t be spending that much time in the kitchen – I promise. But the results will be spectacular! In a large bowl cream together the Sugar and Butter. Blend Eggs in two at a time until smooth. Add Vanilla, Salt and Flour combine until all flour is moistened. 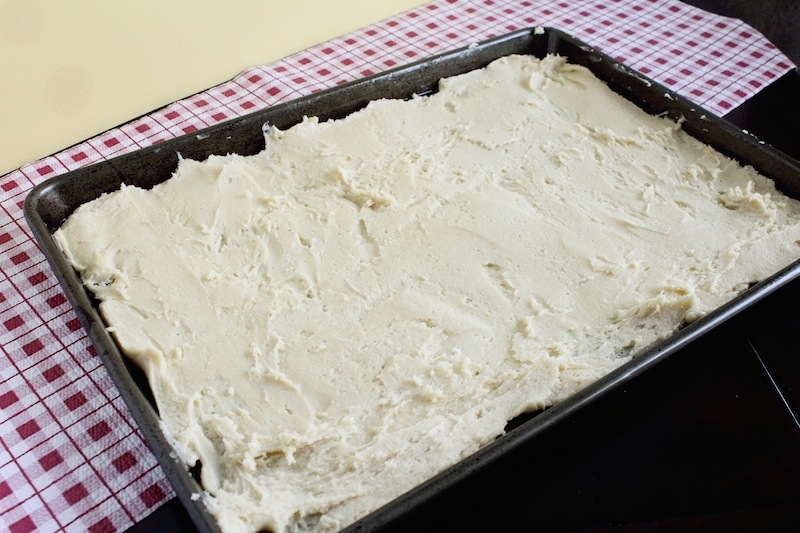 Spread ¾ of the mixture over a greased low rimmed baking sheet. Spread using a silicone spatula sprayed with cooking spray so the dough doesn’t stick, reapply as necessary. Spread the Blueberry filling over the dough. Spread the remaining dough randomly over the filling by the spoonful. Bake at 350˚ until the dough is golden, approximately 50-60 minutes. Remove and let cool. 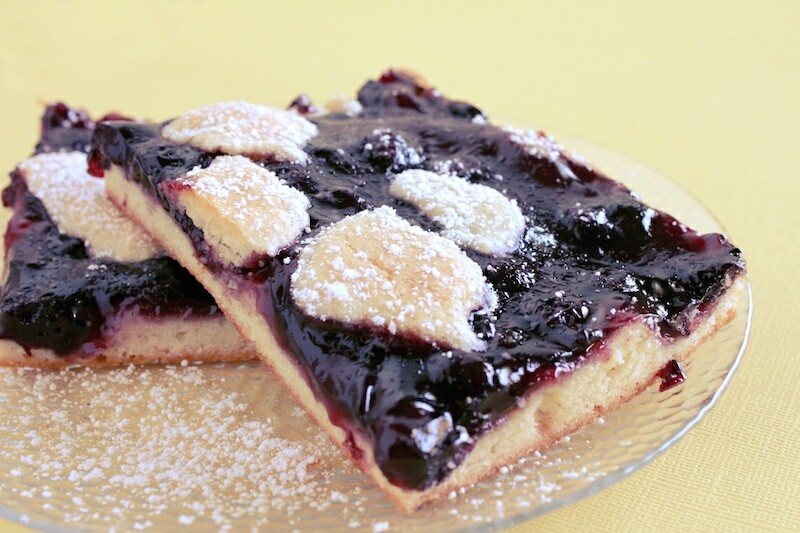 Cut into squares and dust with Powdered Sugar just before serving. 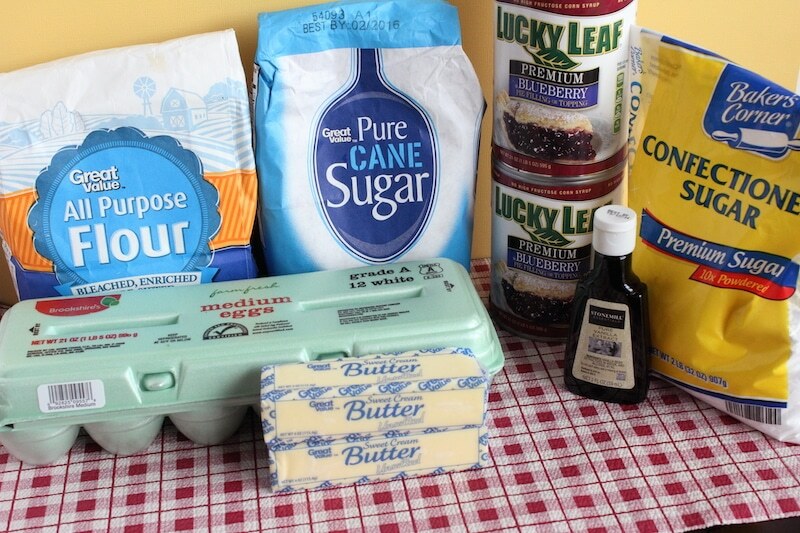 In a large bowl cream together the Sugar and Butter. Blend Eggs in two at a time until smooth. Add Vanilla, Salt and Flour combine until all flour is moistened. 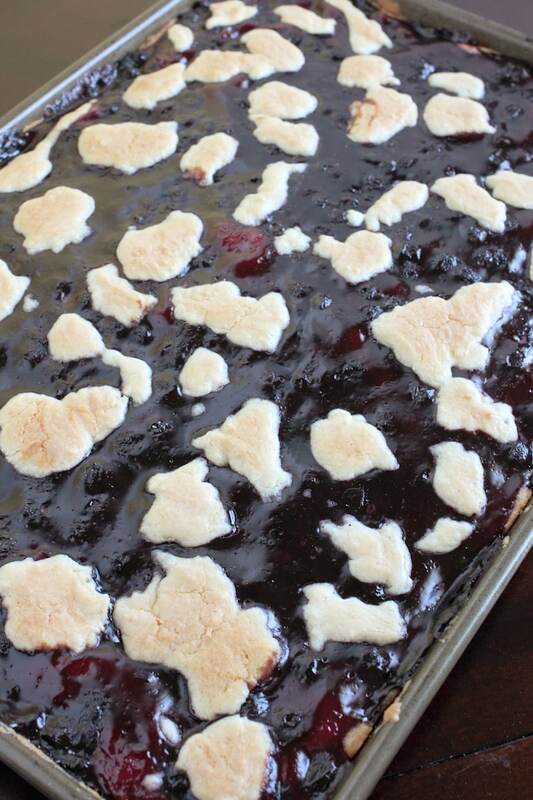 Spread ¾ of the mixture over a greased low rimmed baking sheet. Spread using a silicone spatula sprayed with cooking spray so the dough doesn’t stick, reapply as necessary. 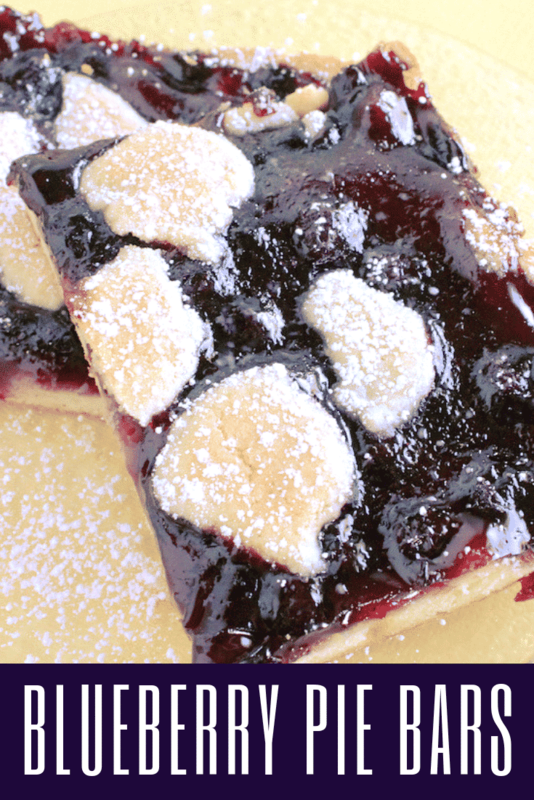 Spread the Blueberry filling over the dough.